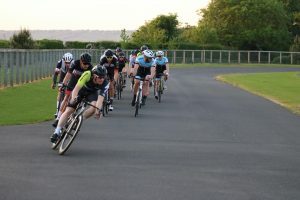 Nathan Hallett continued Latchem Sunwise’s dominance of the E/1/2 races at Odd Down by taking the win from a reduced group sprint on Tuesday. Hallett’s teammate Luke Nolan had taken the win a fortnight ago, but this time he turned leadout man in the sprint as a fast race and calm weather meant that there was no opportunity for a smaller group to get away off the front of the main peloton. Latchem Sunwise were playing a defensive game for much of the first part of the race, as dangerous attacks from George Smith (Tri UK) and Phillips’ teammate Tom Sharp (Bristol RC) were closed down. However, under the impetus of all those moves, the bunch was split in two as the final phase of the race approached. This group featured Hallett and Nolan (Latchem Sunwise), Phillips and Sharp (Bristol RC) as well as individual riders Smith (Tri UK), Gareth Turner (VCEquipe/FlixOralHygiene/Propulse), Joshua Price (Backstedt/Hotchillee), Conor Chandler (Primera-TeamJobs), Jake Hollins and Paul Jones (Bikestrong-KTM) and so with so many of the teams represented there was little motivation for the group behind to continue the chase. And so with Nolan only eligible for half of the rounds at the Summer Series, and with an eye on the overall classification, Latchem Sunwise decided that Hallett would be the chosen man for this week, with Nolan leading him to the win from 500m to go. Nolan was strong enough to hold on for third, with Phillips the only rider able to come around him in order to snare five extra series points. That result narrow’s Phillips’ (175) lead over Hallett (160) to 15 points, with third place overall Tom Sharp a full 61 points further back on 99, just ahead of Nolan (90) and Hollins (82). 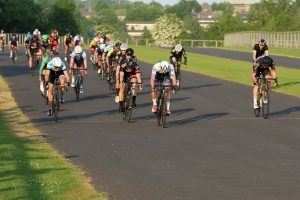 Five riders in the top 13 places has also helped Bristol RC narrow the lead of Avid Sport in the team classification from 102 points to 93 points after four rounds of the series. In the men’s 3,4 race, the large field could not be split, and possibly the biggest group all summer came to the finish together for a huge bunch sprint. Team Tor 2000 Kalas took many of the honours during the winter series with Charlie Revell and they were back to winning ways again on Thursday with Nick Ball outsprinting Daniel Carr (Salt and Sham CC) and Christopher Hill (Bristol RC) for the win. Over 28 riders from the starting group of 50 finished within the bunch by the finish, with many more still on the same lap as the leaders.